Conceptual artist John Baldessari’s first major survey in Latin America brings together more than 80 works spanning his five-decade career. By presenting his varied production – photo collages, videos, sculptures and text-based works – in alphabetical order, the artist is seeking to subvert traditional forms of thematic or chronological display and encouraging viewers to examine objects and images in a new, thought-provoking way. His 2009 26-piece print series titled ABC Art (Low Relief): A/Ant, Etc. (Keyboard) draws from the associations of images and letters that are typically found in primary school and combines them with the banal layout of a computer keyboard to address his central themes of instruction, the classroom and judgment. Baldessari knows of what he speaks. He ran a legendary post-studio programme at the California Institute of the Arts, where he taught during the 1970s and 1980s. There, he attempted to make his teaching “as much like art as possible” by setting assignments that included throwing objects into the air and photographing them, or covering old paintings with new canvases. 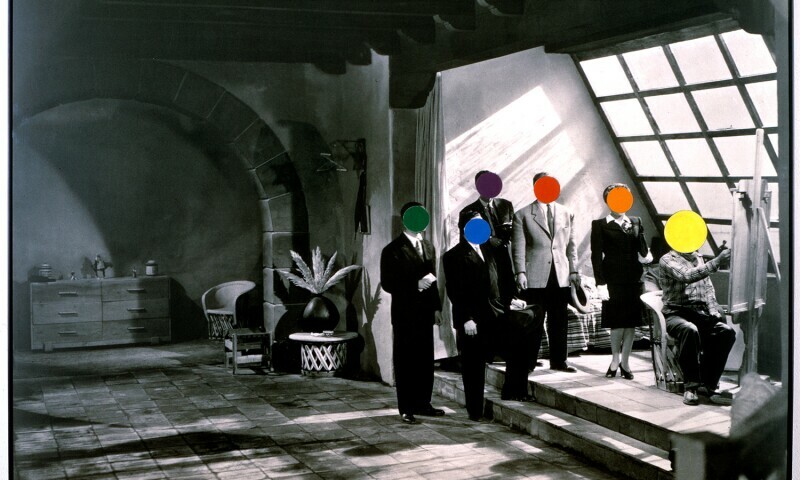 Similarly whimsical directives continue to drive his own practice, as he persuades the eye to reconsider what it is seeing through incongruous pairings of image and text or by changing the narratives of old photographs with the addition of brightly coloured dots.